You are here: Home / How well do you know your hedgehog? The hedgehog comes from an ancient family and fossils suggest that hedgehog-like creatures have been on the earth for about 15 million years. Has it any relations? The modern hedgehog has no close relatives amongst other mammals although it may have distant links with moles and shrews. It belongs to a family all on its own and has developed along a separate evolutionary line for millions of years. The family has a dozen or so species, five in S. E. Asia, three in Africa and two in China but no indigenous ones in the Americas or Australasia. Our British hedgehog is the same species which occurs in most of the continent of Europe and is called Erinaceus europaeus. It has been introduced to New Zealand. 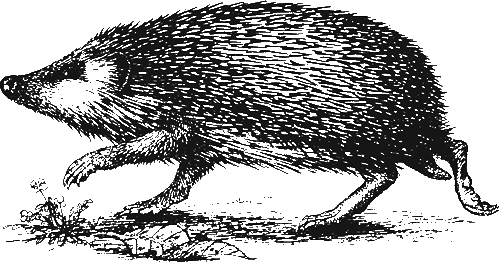 Of course the hedgehog is characterised by its spines. These are modified hairs, about 2-3cms (l “) long, which cover the back of its head and body. As a hedgehog grows the number of its spines increases until when adult it has between 5000 and 7000. By this time it will be somewhere between 20-30cms (8″-12”) in length but its tail will be less than 2-3cms long. Scientists have discovered very little unusual about the hedgehog’s skeleton except the shortness of the neck. This probably helps it to roll up into a compact ball more easily. 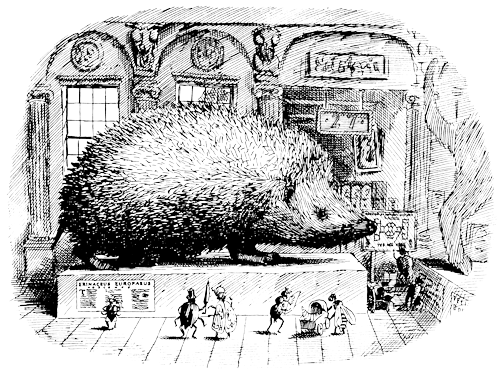 The hedgehog’s peculiar ability to roll itself into a ball, and to stay in this attitude for a long time (especially during hibernation), however, is made possible by the powerful muscle which covers its back like a cape. A look at the X-ray picture of a rolled up hedgehog below will make it clear why this self-defence mechanism means that it has fewer enemies than any other mammal of similar proportions. They have relatively long legs – about 10cms (4″) – and these enable them to run as fast as we can walk. Their weight will be largely determined by the food they get, but most one-year olds will weigh between 450-680g (1-11/lbs). In the mating season the male may be attracted by the different smell of the female and commence a rather prolonged and noisy courtship with her. Hedgehogs do not pair bond and the female raises her young unaided by the male. When the hoglets are about 5-6 weeks old they leave the nest and wander off on their own – they weigh around 250g (8oz) at this stage.